Installation always depends on the particular situation. 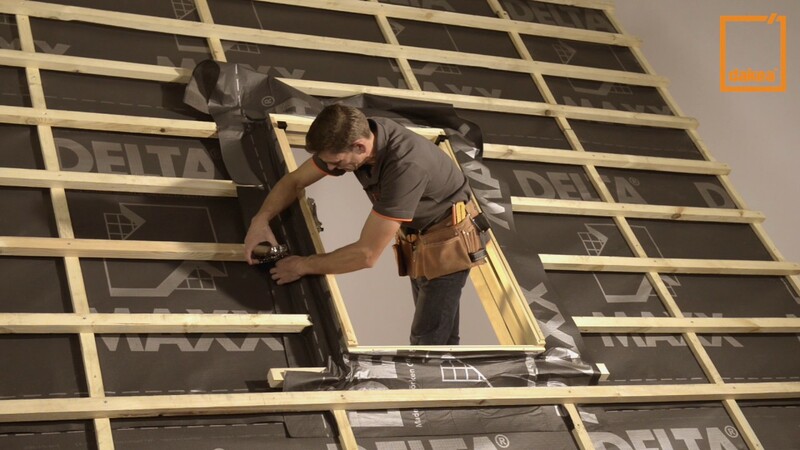 Is it an installation in a new house with no roof and no internal walls - or is it an installation in an already inhabited attic? Is it a house with tiles or is it a house with 100 year old slate? Different roofing materials require different flashings, which require specific ways of installation. 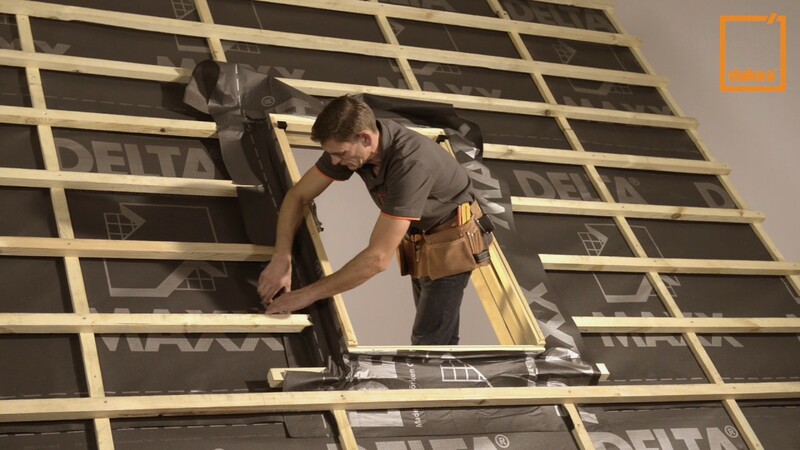 The below installation instruction is showing an outside-in sequence, but it is also possible to make roof opening inside-out. Using snow guard above your roof window is always recommended to prevent permanent damage. Remove battens to the extent of the framed area. The aperture on the roof must be at least 6 cms wider and 12,5 cms (for tile roofing) higher then the outer size of the window. Cut out the roofing underlay. The underlay may be fixed with staples. Cut the excess part of underlay. Determine the correct height of the window installation (for tile roofing only). Fasten a batten to support the window frame. The batten must be levelled, and positioned 8 cms above tiles. Fasten a batten to support the top part of the window frame, and fix the underlay all over. To install the frame, it must first be separated from the sash. Open the sash. Dismount gasspring by gently pulling up with a screwdriver (only KHV). Unlocking the hinge: Locate and press the locking mechanism on each hinge (it should make a click) and separate the sash from the frame. Once the hinges are released, carefully separate the sash and place aside to a safe place. Fix the provided brackets with the screws. Remove the paper tape from IFC and place it on the outer side of the frame! Pay attention to the positioning at the corners and along the edges! Fix the corners with the preapplied glue. Carefully pass the frame (with brackets fixed) through the opening. Place the frame onto the support battens. If the frame is in level, fix the bottom brackets. Replace the sash to test that it opens and closes properly. Reinstall gassprings (only Dakea Best). To make sure the frame is set properly check the gaps at the closure of the sash. If the vertical gaps are parallel as well as the gap at the bottom in slightly opened position, then the frame is correctly aligned, and the top brackets can be fixed. A plastic wedge is supplied to lift the bracket where there is an uneven rafter. Secure all the brackets with the screws. Remove the sash once more to continue with the installation. Remember to push in the locking pin on each hinge. Support the weight of the sash underneath whilst dislocating the hinges and carefully place back inside roof. First the RUC needs to be adjusted to the upper corners of the frame. RUC has to be stretched around the complete frame. Fix the RUC to the outer frame with staples. It is necessary to fix the top of the RUC underneath the existing roof underlay. If the roof is counter-battened, it may be necessary to remove a small section of the batten in order to slide the drainage gutter and RUC into place. Cut the existing underlay over the rafter to allow the top of the RUC to be slid underneath. When fixing the sides, make sure you cut and tightly fix around roof battens. Fix the bottom flashing section to the frame. Using your hands, press and smooth the apron to the contours of the tiles. If necessary, a rubber mallet may be carefully used to shape the apron. Fit the side flashing sections. Make sure the side flashing section interlocks properly into the bottom section. Bend the flappers of the bottompart to fix the sides. Fasten the flashing side parts to battens using the provided clips. Fix side cover parts using the provided screws. Fit top cover part, fix it with the provided screws. Fasten the top flashing section using the flappers on side cover parts. Replace tiles. In order to avoid having a gap between the bent foam and the tile junctions, it is recommended to slit the foam right above each tile. You are likely to need to cut the tiles on one side of the frame to make a perfect fit. Ensuring the gap is within the recommended tolerances (30-60 mm on the sides, 60-150 on the top). Replace the sash in frame. Fix the gassprings (only Dakea Best).